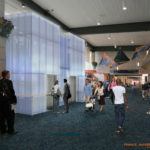 The Connecticut Airport Authority is constructing a new dual cab passenger elevator and a public information booth in Bradley Airport’s Terminal A. The elevators will provide improved traffic flow and more convenient access for arriving and departing passengers. The information booth will be Bradley’s official information center for all airport visitors. The construction began in January of 2017, and is expected to be complete in the fall of 2017. Temporary construction walls have been installed surrounding the work areas to minimize impacts on passengers traveling through the Terminal. Wayfinding signs have been adjusted for the duration of the construction and will guide the public around the work areas. The dual cab elevator will be prominently located directly across from the main security checkpoint and the bottom of the main escalators serving both arriving and departing passengers. 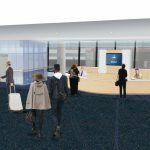 The new information booth on the lower arrivals level will be located adjacent to the new elevators, directly across from the main escalators and staircase. The first phase of construction, which ran from January to April of 2017, focused on making room for the new elevators with the relocation of the existing mechanical systems. The second phase of construction is currently underway on both the lower level and the upper, departures level. While much of the work will be performed within the closed construction areas with heavy construction (i.e. demolition) occurring during off-peak periods or overnight hours, there may be periods of activity which could have an impact to the traveling public.